A stiff southwest wind riled the unfrozen River Raisin. Small flocks of Canada geese loafed on the south bank, in the lee of the gusts. Now and again a goose honked while others rested their heads on their backs. A broad sycamore leaf cartwheeled overtop short tufts of prairie grass. Wispy white clouds drifted. The day dawned with unseasonable warmth, nothing like those of mid-January in 1813, and smelled like a strange blend of winter’s dry cold and spring’s wormy, wet mud. The wind carried the faint, marching cadence of snare drums, distant, foreboding, determined. In a few minutes, the shrill encouragement of fifes joined the drummer’s beat. It was then, when General James Winchester’s legion first came into view in the heart of Old Frenchtown, that three geese banked low overhead. Their constant ke-honking was no match for the fife and drum’s ominous drone. Lacroix’s infantrymen of the Michigan militia, named for Captain Hubert Lacroix from the River Raisin settlement, led the column. At the east end of Frenchtown, the militiamen pin wheeled left with military precision. The same wind that brought the Raisin to life unfurled the company’s American flag, 15 stars and 15 stripes trimmed with gold fringe. The seriousness of the day marked each soldier’s face. Other militia companies, some from as far away as Kentucky, and regular troops from the new American Army of the Northwest Territory marched onto the parade grounds. Colonel Henry Proctor’s British forces and their Native American allies stood shoulder to shoulder with the American forces, unlike the days of mid-January in 1813. 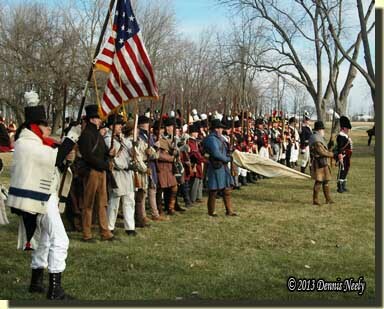 This past weekend about 300 War of 1812 re-enactors gathered at the River Raisin National Battlefield Park in Monroe, Michigan, for the solemn commemoration of the 200th anniversary of the Battle of Frenchtown, sometimes referred to as the Battle of the River Raisin. In addition to Michigan, living historians came from Ohio, Indiana, Illinois, Kentucky, Pennsylvania and Ontario, Canada, for the weekend activities. Old Frenchtown (present day Monroe) was located at the mouth of the River Raisin at the western tip of Lake Erie. In August of 1812, General William Hull surrendered Fort Detroit to British Colonel Proctor, along with the entire Michigan Territory. By the end of the year, British troops and some of their Native American allies occupied the Frenchtown settlement. After the surrender, President Madison appointed General William Henry Harrison commander of the Army of the Northwest Territory. Brigadier General James Winchester was second in command. General Harrison’s plan was to retake Fort Detroit during the winter. Harrison split his army, led his troops to Upper Sandusky and sent General Winchester with 2,000 untrained regulars and volunteers from the Kentucky militia to the rapids of the Maumee River, near present day Perrysburg, Ohio. The residents of Frenchtown requested relief from the British occupation; Winchester sent Colonel Lewis with a detachment to Frenchtown, following a course down the Maumee then north along the frozen shore of Lake Erie. On January 18, 1813, Lewis’ men engaged a small detachment of British and Native Americans, driving them from Frenchtown. On January 20th, General Winchester arrived with 250 reinforcements. When Harrison heard of the skirmish, he ordered additional troops to Frenchtown, concerned Winchester might face a strong attack from Proctor. General Winchester’s troops had not seen any heavy fighting prior to Frenchtown; he expected it would take days for the British to launch an attack. But British reinforcements, both regulars of the 41st of Foot and Native Americans, arrived from Fort Malden. Proctor marched his army over the ice of the Detroit River, bringing six cannons, and stopped five miles north of Frenchtown late in the day on January 21st. The next morning, before daybreak, Proctor counterattacked, catching the Americans by surprise. The Americans were outmaneuvered and pulled back, sustaining heavy casualties. General Winchester was captured in a retreat. Proctor convinced Winchester that Frenchtown would be burned and all the wounded killed by his Native American allies, so General Winchester surrendered. The surrender ceremony was short because Proctor believed Harrison would soon arrive with reinforcements and mount a counterattack. On the afternoon of January 22nd, Proctor’s British regulars, Canadian militia and those American prisoners able to walk (about 500) set out for Fort Malden. The wounded (about 60) were left behind because the sleighs were full; Proctor said he would return the next day with more sleds and take the wounded to Fort Malden. The next morning, January 23, 1813, about 200 Native Americans entered Frenchtown, seeking revenge for their casualties. After a confrontation with Dr. John Todd, one of two surgeons left to care for the wounded, the massacre began. The wounded who could get to their feet were taken captive, those who could not were tomahawked. The Battle of Frenchtown, the largest and bloodiest military battle fought on Michigan soil, was now The River Raisin Massacre, kindling the battle cry “Remember the Raisin” for the rest of the War of 1812. In the aftermath, Colonel Henry Protor was promoted to Brigadier General. General James Winchester spent a year as a prisoner of war. The American force sustained 379 dead, 561 wounded or captured; the British losses amounted to 24 dead, 158 wounded; and the Native American casualties were never recorded. As an aside, Captain Hubert Lacroix’s militia unit was included in the terms of Hull’s surrender, disbanded and the men released as paroled prisoners of war in August, 1812. Today, Lacroix’s Company is the official War of 1812 Bicentennial Re-enactment unit for the City and County of Monroe, Michigan. 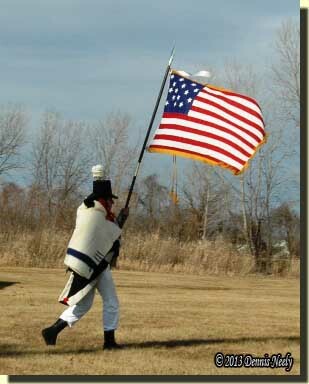 As a sub-committee of the Friends of the River Raisin Battlefield (a 501c3 non-profit organization), members of Lacroix’s Company support living history programs at the Monroe County Historical Museum, the Navarre-Anderson Trading Post and the River Raisin Battlefield Park Visitor Center, in addition to participating at other War of 1812 events. Walking the park grounds is a humbling experience. 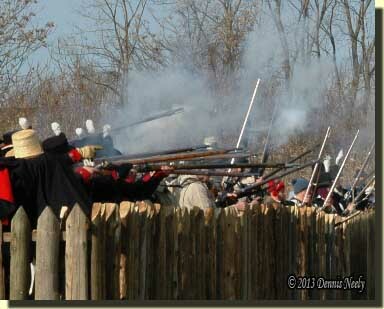 For an hour or so the crack of muskets, the cannon thunder, the battle whoops, the brassy bugle notes and the pleasant stench of burned gunpowder gave a sense of life to the Battle of Frenchtown. But like all re-enactments, the crowds thin, gear gets stowed and all that remains are vivid memories, a wind-swept prairie and snapping flags in front of a modern-day visitor’s center. The bicentennial of the War of 1812 is in full swing. As I watched the soldiers take their places at the “Frenchtown fence,” I realized a tremendous opportunity exists for traditional black powder hunters, both newcomers and old timers. The War of 1812 was America’s second War of Independence, and offers a myriad of possible traditional hunting personae or scenarios, depending upon one’s chosen time period. Yet, rarely have I heard a living historian depicting early 19th-century life in the Great Lakes region mention the war, and only once has the phrase “Remember the Raisin” been uttered. Suffice it to say, any traditional black powder hunter who portrays an individual in the early 19th century, especially a former soldier who saw service in the War of 1812, should keep the phrase “Remember the Raisin,” on his or her lips. And on this day, two centuries removed, let us take a moment and offer a prayer for those who died and those who survived. “Remember the Raisin,” be safe and may God bless you. This entry was posted in Persona, Scenarios, Worth thinking about... and tagged Dennis Neely, historical trekking, North West trade gun, Northwest trade gun, traditional black powder, traditional black powder hunting, traditional blackpowder, traditional blackpowder hunting. Bookmark the permalink.